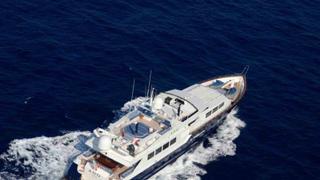 The 36.9m motor yacht ADO has been sold with Steve Smith at Denison Yacht Sales representing both buyer and seller. Built in aluminium by US yard Broward Marine with delivery in 1990, ADO had a thorough refit in 2010 including a new interior by Janet Richards. She received further upgrades in 2015. Accommodation is for 10 guests in five cabins configured as a main deck master suite, two doubles and two twins, all with entertainment centres, television screens and en suite bathroom facilities. The main saloon enjoys superb panoramic views in almost every direction provided by the full height windows in both aft doors and the large windows to port and starboard. On the starboard aft corner, there is a companionway leading to the four guest cabins below. Just forward of that on the starboard side is a large wrap around settee with cocktail table and matching chairs. Forward of that is a buffet and china cabinet separating the dining area from the lounge area. The formal dining table will easily seat eight guests. Expansive deck areas offer plenty of spaces for al fresco entertaining while, on the top deck, there is a very large eight-person Jacuzzi and ample sun pads for taking in the beautiful views and enjoying the sun. Twin 1,450hp Detroit Diesel engines give her a cruising speed of 12 knots and she is fully equipped for charter or private use with a range of tenders and toys.